I just feel like we cannot evade the germs; I make everyone wash like robots and still never enough! Temp Traq is this awesome wearable patch that tracks body temperature 24 hours! How cool is that! This is really as simple as downloading the app, applying the patch and assigning it to the app. 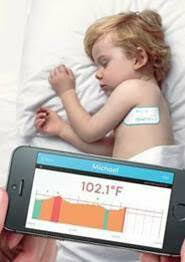 You never have to wake your sick child up to monitor their temperature again. The patch is actually very comfortable and it will alert you to a registered fever. Oh; and you can monitor multiple children at once! This is a new mommy must! Think shower gift! Really easy to grab up on amazon or at target to name a few places!